Italy’s System SpA pioneered the technology and machinery used to manufacture the first giant 300 cm x 100 cm x 3 mm panels of porcelain. Marketed under the Laminam brand name, these products are available in Australia from major distributor Plastral Pty Ltd which holds significant stocks. Plastral in turn supply Living Tiles in Sydney and other companies engaged in commercial and residential tiling projects. When System SpA introduced Laminam it reached agreement to manufacture specific colours for some producers including Italy’s Provenza. Other companies actually acquired System machinery and developed their own product, including Italy’s Cotto D’este and Turkey’s Kalebodur. Chinese manufacturers generally recognise a good thing when they see it, consequently Mona Lisa launched a robust 6 mm product. Laminam (Italy) realised the potential of the market in China and they quickly established a partnership with China’s Bobo, which organised a meeting with 200 architects and designers at the Swisshotel in Foshan, China. Bobo recognised and understood the benefits of Laminam. In 2009 Bobo Laminam displayed an enormous range of low-thickness products at Expo-Build Shanghai including the Paris collection of solid colours in 300 x 1200 mm, 600 x 1200 mm, 600 x 600 mm, 300 x 600 mm and 300 x 300 mm in 5 colourways, supplemented by a range of geometric and stylistic floral designs. They also displayed the Bobo Space Art brand, a bold collection of highly decorative digital designs which are primarily produced in 600 x 1200 mm panels. The Bobo Paris and Space Art collections are produced in a 4.8 mm thickness. reformulation of a tile body allowing a 50 per cent reduction in the overall thickness of the body. This allows manufacturers to use traditional manufacturing processes, thus saving time and preserving the integrity of the finished tile body. 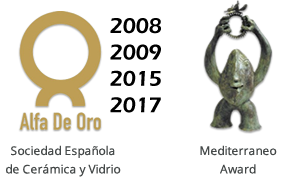 This innovative process received two prestigious Alfa de Oro awards. Neos products are distributed worldwide by Italian company Smaltochimica. The type and volume of additive used varies in accordance with the physical dimensions of the low-thickness tile or panel and its thickness. The prime objective is to maintain flatness and dimensional stability, which is achieved by controlling pyroplastic deformation during firing. 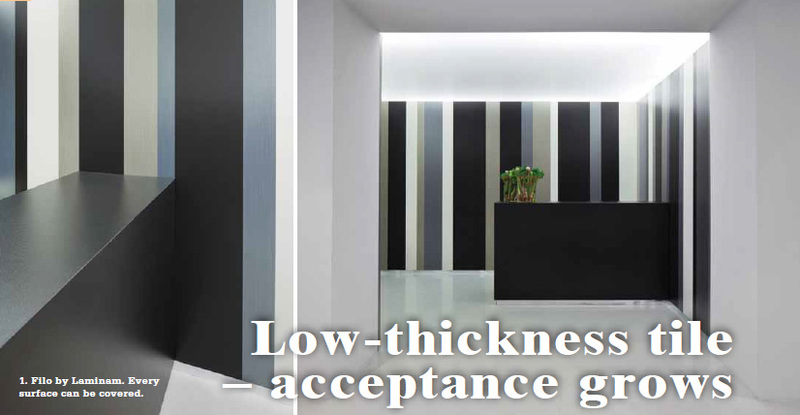 Many of the large thin panels and lowthickness tiles meet the requirements of ISO 13006 and EN 14411 for ceramic tiles. By 2010 Laminam were manufacturing panels and tiles in a wide variety of formats and thicknesses, including a 7 mm product primarily designed for use on kitchen benchtops.